Kirkpatrick Sound Engineering has more than 40 years experience in the design, supply and installation of professional audio and audio visual systems over a wide variety of customers and applications within the U.K. some of which are listed below. Audio, assisted hearing loop and audio-visual systems in many churches and chapels. Contact us now for sound advice! Kirkpatrick Sound Engineering is proud of it's reputation as a quality sound and audio visual systems designer / installer built up over many years of successful trading. We always aim for the best system possible for you taking into consideration the audio charactaristics of the room the aesthetic challenges posed by your particular building and the use that you put it to.Having a detailed understanding of accoustics coupled with the use of state-of-the-art technology we are able to design and install audio systems that give you pleasing natural sound with minimum visual impact even in difficult sensitve situations. We are pleased to offer our expertise and experience in audio and audio-visual systems design as a Design and Consultancy Service to architects and to project design/ management companies. We will if required and appropriate, design from plan, carry out site visits and meet with your representatives/clients before preparing a design package to meet your requirements for implementatiom by 3rd party installers. 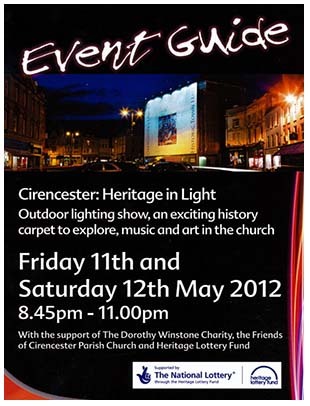 Kirkpatrick Sound Engineering together with Mick Orr of Bremner & Orr Design Consultants Ltd conceived, designed and sucessfully produced a two night outdoor audio-visual show for the Cirencester 'Heritage in Light' event where we used a high powered 'Christie' projector to display a light show onto the wall of a newly restored heritage building together with an audio system to relay sound from within the building out to the light show display area.